Celtic full-back Mark Wilson revealed his relief at discovering his latest injury setback might keep him out for ten weeks rather than ten months. 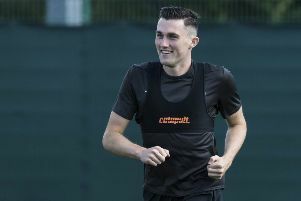 The 27-year-old has been plagued by injuries since he signed from Dundee United in January 2006 and last week underwent an arthroscopy procedure on his knee. Wilson admits he had to eventually give in to the pain after the two games against Hibernian at the end of last month. “I had the scans weeks ago on my knee and it showed problems that I obviously knew I had because of what I was feeling. I was just trying to manage it as best I could and play as many games as I could,” he said. Kris Commons, also speaking to the Celtic View, has revealed how he pretended to be injured to quash ongoing rumours of a bust-up with Celtic manager Neil Lennon. The Scotland international turned up at training at the start of the month wearing a neck brace and with his head bandaged, to the amusement of his team-mates and the delight of the photographers.